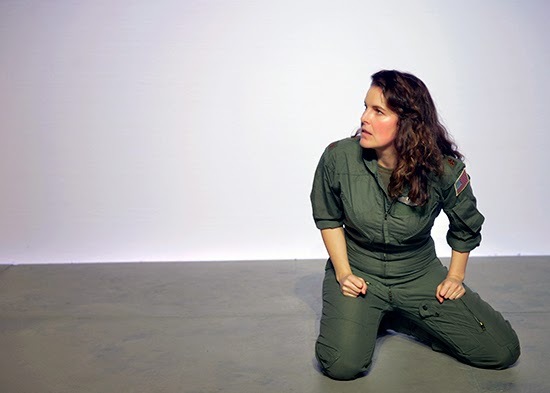 Seymour Centre, Red Stitch and The United States Studies Centre at the University of Sydney present, GROUNDED, by George Brant, in the Reginald Theatre, City Rd Chippendale, May 1st - 16th. An exhilarated female Top Gun flies her own plane, her 'Tiger", striking down the enemy, begins a relationship with an ordinary but love-smitten man, becomes pregnant, is required to stop flying, has a girl child, Sam, and later returns to the Air Force as part of "The Chair Force" in caravans in the desert of Nevada, within driving distance of Las Vegas, in what she calls "The Bermuda Triangle" for pilots, manning, remotely, drones, above the battle fields of the Middle East, becoming "an eye in the sky" to smite the "guilty". The intensity of the 12-hour, 7-days a week pattern, the required operational secrecy and the constant staring at the grey screen with her team for days and days, searching for an image of what could be a target, where, they alerted, as "god" can kill the "prophets", only to stay to see, hovering above, the consequences of the remotely pressed button, then to return home in her white car back across the desert, past the pyramid (hotel) in the Las Vegas emptiness, to her saddened but adoring husband and Sam with her pink Pegasus ponies, "exhausts" our heroine. Now, locked in a concrete cell, to preserve the secret of the drones in the desert and its devastating remote warfare, she remembers all, just for us, in a never stopped monologue of grief and guilt. In a powerful feat of concentration and actor's courage, Kate Cole, grasps us and holds us suspended through great dynamics of voice, body, imagination and experienced emotions, to take us on an unforgettable, beautifully nuanced journey. It is a magnificent performance. Eighty remarkable minutes. Guided by Director, Kirsten Von Bibra, in a claustrophobic cell shape, accompanied by smart situational lighting (just, sometimes a little James Turrell - amazing), the Visual Design is by Matthew Adey, and brilliantly supported by one of the best Composition/Sound Designs for the theatre of my recent experience, by Elizabeth Drake. Ms Cole's performance and this production of this writing justifies my relentless search for the great live experience in the theatre. This work balances out the many, many disappointments of one's theatre going addiction. GROUNDED is a hit, a palpable hit. I am very glad I followed your recommendation, Kevin; play, production and performance were of exceptional power and subtlety. Kate Cole enters and draws us right into her world; her joy, her swagger, her surprise, her disappointment, her horror are all compelling. Never is there a moment when she seems uneasy with the shifts - often bracingly quick - that are required of her. Her vocal powers, her physical ease are gifts to the demanding text.